Cytocare 532 is an injectable rejuvenation booster and dermal filler containing hyaluronic acid and a rejuvenating complex with vitamins, minerals, amino acids, and other nutrients. Cytocare 532 is suitable for injection into the middle dermis or superficial dermis of the face or neck for correcting fine lines and wrinkles, rehydrating the skin, and rejuvenating the skin. Cytocare 532 is a hydrating and wrinkle-reducing injection made of hyaluronic acid and a rejuvenating complex. You can order Cytocare 532 online from MedicaDepot.com or you can phone our friendly customer service associates to order this and other medical products. 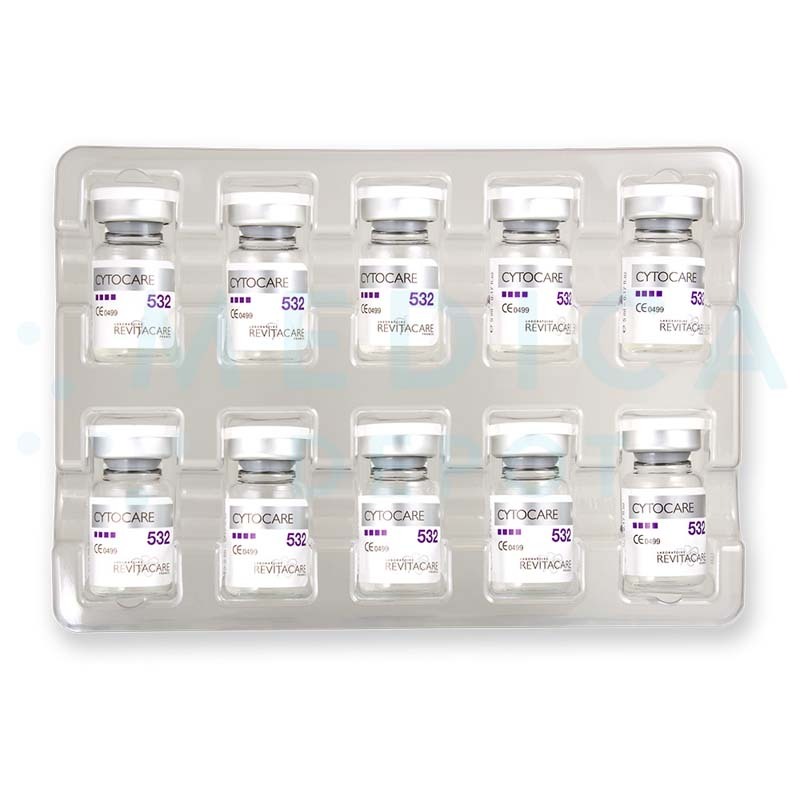 When you buy wholesale Cytocare 532 from Medica Depot, you can reduce the look of your patients’ fine lines and wrinkles and improve their skin's moisture, elasticity, and tone. Cytocare 532 is part of a range of mesotherapy treatments aimed at rejuvenating facial skin. This product is implanted into the mesoderm, where it rehydrates the skin, protects it from free radical damage, and improves the dermal structure. Consequently, the skin condition improves, with the face looking markedly younger, softer, and more attractive. Cytocare 532 is made up of hyaluronic acid and a proprietary blend of vitamins, minerals, amino acids, and other nutrients, which is known as complex CT50. The hyaluronic acid serves to rehydrate the dermal layer and to plump the skin, correcting fine lines and wrinkles, while CT50 promotes skin cell growth, which helps restructure the dermal layer and improve skin condition. 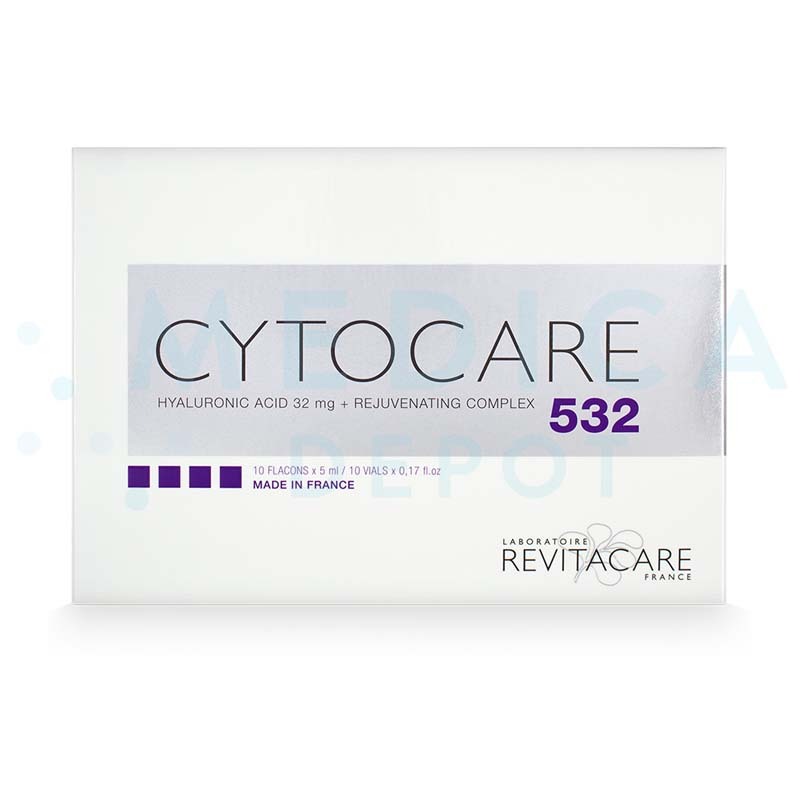 Cytocare 532 contains hyaluronic acid, the CT50 multivitamin complex (retinol, thiamin, riboflavin, nicotinamide, dexpanthenol, pyridoxine, ascorbic acid, ergocalciferol, and tocopherol), ammonium molybdate, ammonium metavanadate, calcium chloride, iron sulfate, potassium chloride, copper sulfate, magnesium chloride, manganese sulfate, sodium acetate, sodium hydrogen carbonate, sodium chloride, sodium hydrogen, phosphate, sodium metasilicate, sodium selenite, nickel chloride, tin chloride, zinc sulfate, alanine, arginine, asparagine, aspartic acid, cysteine, glutamine, glutamic acid, glycine, histidine, isoleucine, leucine, lysine, methionine, phenylalanine, proline, serine, threonine, tryptophan, tyrosine, valine, adenine (vitamin B4), biotin (vitamin B8), calcium pantothenate, (vitamin B5), choline chloride, folic acid (vitamin B9), inositol (vitamin B7), nicotinamide (vitamin B3), pyridoxine (vitamin B6), riboflavin, (vitamin B2), thiamine (vitamin B1), vitamin B12, deoxythymidine, glucose, putrescine, sodium pyruvate, and lipoic acid. Cytocare 532 is suitable for mesotherapy treatments to rejuvenate the skin of the face and neck. 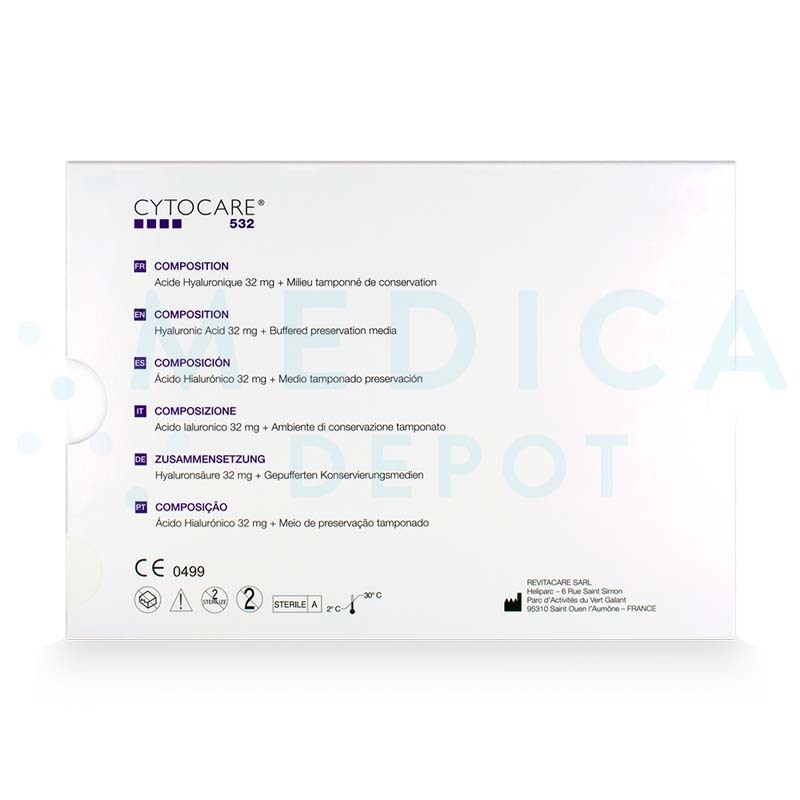 Inject Cytocare 532 into the middle or superficial dermis using injection techniques like point-by-point, retrotracing, cross-hatching, or fanning. You should start treating your patients with Cytocare 532 when they show visible signs of aging on their face and neck, such as fine lines and wrinkles. When you first start treating your patients with Cytocare 532, administer the injections in 3 treatment sessions 3 weeks apart. After this initial set of treatments, inject Cytocare 532 once every 3 months to maintain the results. However, you can adapt this treatment schedule to suit your patient's needs, depending on the quality of their skin and their age. Cytocare 532 can be used on the face, neck and the backs of the hands. Patients can expect immediate and noticeable effects from the first treatment session. These results may last several months, depending on the hyaluronic acid metabolism rate of the patient. In order to maintain these effects, top-up treatments are necessary. Individuals who are looking to treat the signs of aging on their facial skin are ideal candidates for Cytocare 532. Cytocare 532 is particularly suited to treat mature skin that is moderately damaged or aged. This treatment is not suitable for individuals who are hypersensitive to hyaluronic acid, who are breastfeeding or pregnant, or who are under the age of 18. Aging skin comes with a variety of cosmetic issues. While the most obvious problems are lines and wrinkles, skin can also become dry as it loses its hyaluronic acid content. Moreover, as collagen and elastin break down, the skin can start to lose its tone and elasticity. Using a mesotherapy treatment like Cytocare 532 can reduce the appearance of lines and wrinkles while rehydrating the skin and improving its overall structure. This can give your patient's face a more youthful appearance. 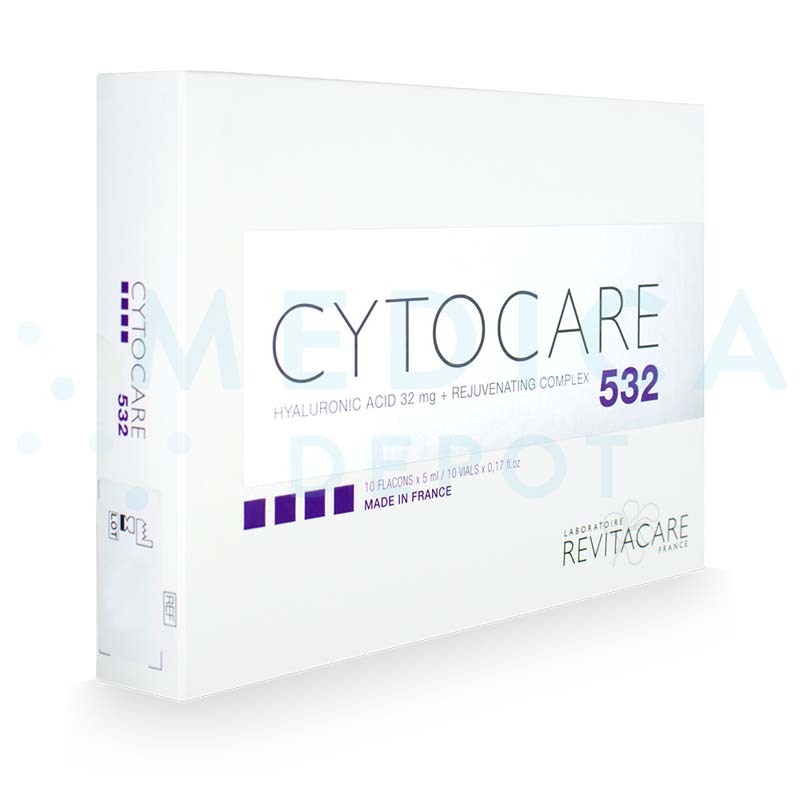 Order wholesale Cytocare 532 from Medica Depot to correct the signs of aging for smoother and more radiant skin. Common side effects of Cytocare 532 could include bruising, redness, mild swelling, itching, and tenderness at the injection site. These side effects are usually mild and generally resolve on their own.